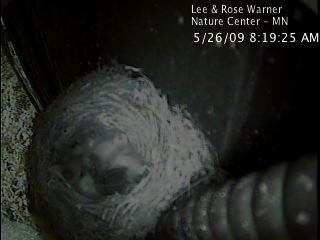 The Memorial Day holiday took me away from web access which of course means the eggs in the Phoebe Nest have hatched. According to co-workers who were in on last Friday, that is when the action first started. I was so busy today I didn't have much time to check on things but now several (if not all) of the eggs have hatched. I was able to grab a two random shots during the day, the morning one above and the afternoon one below. Sorry, they aren't the best. In the top photo I can clearly make out two birds for sure. 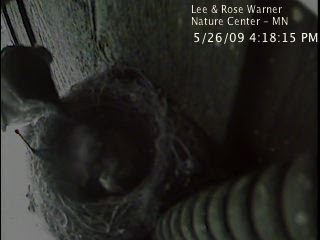 It will be really interesting to watch over the next two weeks to see how the phoebe nestlings do with two huge fast growing cowbirds in the nest. Here's one of the parents bringing back some food. Much better pictures will be coming in the next few days. I may also monkey with the feed a little to see if we can get a little crisper image.